I win the meatloaf contest. 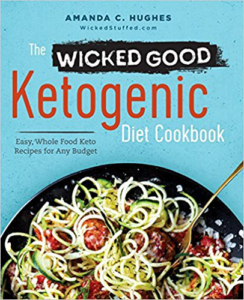 All other meatloaves can take a hike because this one is the best keto meatloaf… scratch that.. the BEST MEATLOAF you’ll ever eat and you can find it in The Four-Hour Chef by Tim Ferriss (amongst many other delicious, paleo and keto-friendly recipes). Add 2lbs of meat and 2 eggs into mixing bowl. Add finely chopped scallions, garlic, and onions. Mix it up together. Add cayenne, oregano, salt, pepper and mix up again. Throw down some plastic wrap on the counter and then roll out your meat on top of it. Try to flatten it out and create a rectangle (mine was a little long) and then add the spinach and goat cheese to the middle. Using one side of the plastic wrap flap one side into the middle, and then do the same to the other, so they create a roll. Pinch and smooth out the ends so the filling stays inside the meatloaf while cooking. Dress up the top with your tomato paste (or leave it dry to make it more keto friendly), sprinkle some fresh rosemary on top. Cook about 50-60 minutes until the middle hits about 150 degrees. Cut it in half to make sure everything’s cooked! Cut into delicious, mouth-watering slices and enjoy! For another amazing stuffed keto meatloaf recipe be sure to try my Blue Cheese Stuffed Buffalo Chicken Meatloaf next. Pssst.. like this recipe? 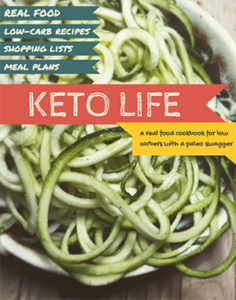 Download my Keto Life Handbook / Cookbook! Love this recipe? Retweet about it! #Keto Recipe: Ah-Mazing Keto Pizza Bites – Tastes like Totinos Pizza Rolls! Mm, this has YUM written all over it! Great meatloaf! Will definitely make again with a few tweeks for my taste. Don’t scimp on the spinich and dont forget the salt! Just made this an hour ago. I actually got full off of two slices. Best meatloaf I’ve ever had! I made this tonight and it was absolutely delicious! Made this last night. I love it. Wife and kids didn’t like the goat cheese. I know that is an acquired taste. Might substitute another cheese next time. Not a fan of goat cheese. What would you suggest as a substitution that would still have flavor? I only had 2 oz of Goat cheese so I mixed in 2 oz of Feta, and its AMAZING!! @rimarkimar It would be different flavor entirely, but maybe mozzarella? Hmmmm… I don’t think Feta would work. You might like goat cheese in this combo though! @Debbie Yawn Curran Excellent substitution! I’ve never had it that way, but it sounds like the best replacement! @Stephanie So glad you liked it! @Rick Epperley Definitely an acquired taste! Somebody recommended cream cheese, maybe try that? @Arxos It’s soooo filling, right? Glad you loved it! I made this last night! I added chopped red pepper and fresh parsley and basil to the meat mixture and then roasted red peppers to the stuffing…just because I had those things and wanted to use them. It was by far the most delicious meatloaf I have ever had. Thanks!! I look forward to trying out many more of your recipes!! Am in the process right now of making this delightful meatloaf – however I am adding sweet italian sausage and blue cheese. I expect it to turn out great! Thanks Ellen for this recipe! Hubby LOVES this meatloaf and doesn’t even miss traditional meatloaf now. I use cream cheese and omit the spinach, as I’ve a bad habit of letting it go bad before I get to use it, and it’s very yummy! Thanks for the awesome recipe! nice idea – try adding fresh sliced mushrooms, black olives sliced and even a Tbsp of Italian Olive Salad mix to center, too. I hooked up with Dr. Berg online two years ago. His naturopathic nutrition program has turned my life around. So glad more n more people r turning away from traditional medicine and eating the Right way! I tried it tonight. Most meatloaf recipe’s are a page long. 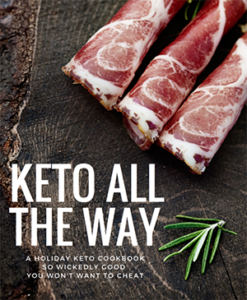 Hense why I have been putting off making this keto dish. This is so simple to make and I like it allot. My wife did not care for the goat’s cheese. I liked it allot actually. Next time I will use creme cheese for her as many have done. trying this with mozzarella. Will update with level of deliciousness! I did this with blue cheese! Perfection! Really delicious and easy to make. This is a keeper. Thanks so much! This is very similar to a pinwheel meatloaf recipe I make with spinach and cottage cheese. I have to be carefully of cottage cheese now because there is 4 carbs in half a cup. I’m going to make this for sure. Looks awesome. I’ve made this so many times and OMG it’s yummy! Did you cover it? It was popping all over the oven so half way I covered it. I am making this for the second time . My husband and I love it. Didn’t do so well with flip, it flopped. So I just put a layer of meat in a pan, added the spinach and mozzarella and kind of built the meat top around it. Added pizza sauce to the top and Italian seasonings. Yum!thank you!